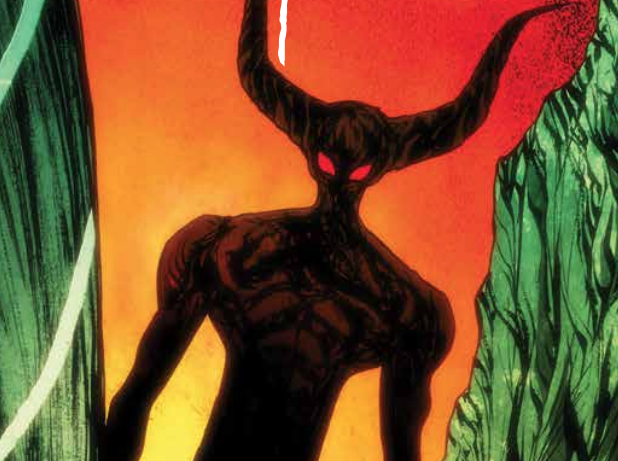 Dark Ark #12 Review – AiPT! This is Bunn and Doe at their very best. Dark Ark #12 is out this week from Aftershock Comics and it is a game changer for this awesome series from writer Cullen Bunn and artist Juan Doe. When we last left Shrae and the inhabitants of the Dark Ark, the rains had subsided and there was hope that their long, hard journey was coming to an end. With the dawning of this new world came the arrival of two first born sons. One, a manticore born to Kruul and his mate, and the other a human male born to Shrae’s son Avner and his wife Selah. Tragically however, during an attempted vampire uprising early on in the journey, Selah was fed upon by several vampires while with child. This caused her son to be born a monster, and with the help of the vampire Nex and his three witches, the child was cured of the affliction and made human again. The ancient blood ritual used to achieve this came with a cost however, and Shae’s wife Ada took the tainted blood and essence of darkness into herself to complete the ritual and save her grandchild. In this issue, the dark sorcerer finds himself with his wife locked away ravenous for blood and flesh but powerless to help her. The closer that they get to completing the journey, the more Shrae’s powers starts to fade. Shrae goes to the dark Gods to ask them to help his wife, but her act of selflessness repulses them and they refuse him. The bargain struck for completing this task for them was that Shrae and his family could be done with the dark deities and build a normal life for themselves in the new world. This is but a taste of the suffering he and his family will endure without their gifts or protections. The vampire Nex senses this and is already scheming about what sinister and horrific things that he and the other monsters aboard the ark will do to all of the humans once they arrive safely on land. The Dark Ark soon makes landfall on an island, and before the rest can set out to investigate, a pair of fly-like monsters hastily disembark to explore this new world. As they fly along the landscape they come upon an ancient man-made temple. The creatures make their way around the temple looking for an entrance and are suddenly shot down and killed by a barrage of arrows, discovering all too late that they are not the first ones to arrive here. Cullen Bunn’s writing on this entire series has been brilliant but this 12th issue really takes the story to even deeper levels. As one journey ends a new one begins. With the revelation of Shrae’s bargain with the dark gods and his powers as a sorcerer fading, Bunn gives the reader a glimpse of the hardship and struggle ahead for the our hero and his brood. With this issue titled “Landfall” the fight for survival shifts between saving the dark creatures of the world from the wrath of God, to saving his family from the demonic ravages of those same monsters. There is also a new threat with these mysterious beings already inhabiting the island. Cullen Bunn gives the reader resolution but also a taste of even darker things to come. The way that this story has unfolded throughout the series is masterful and the writing on this issue is pivotal in setting the tone for this third act. The illustrations and artwork on the series have been wonderful since issue #1, but Juan Doe really amps it up quite a few notches on this one. Just his cover art alone is compelling and breathtaking. The composition and transitions on every page are fluid and do a magnificent job of conveying the concern and struggle that Shrae faces with barely a word of thought or dialogue put upon the page. The level of artistry and craftsmanship is Doe’s best thus far, and these new mysterious creatures that have been introduced to the story look so cool and badass. Overall this is a flawless issue that gave me everything that I wanted and then surprised me, leaving me hungry for more. It completes a journey that was started all those issues ago but then changes everything up leaving the reader on the edge, waiting to find out what will happen next. This is a must-have issue for anyone reading this title and not to be missed. I would also highly recommend this installment to anyone interested in getting into this amazing series due to its breathtaking artwork, brilliant storytelling, and transitional qualities. This is Bunn and Doe at their very best. If this is any indication of things to come, then it is sure to be a magnificently horrific ride. Dark Ark #12 is perfection. It completes the journey of all of the previous issues, paving the way for even darker and more sinister adventures ahead. Absolutely masterful artwork that is breathtaking and beautiful. Brilliant storytelling that moves the story along in a way the changes everything for the characters involved. New mysterious creatures and a new world to explore and discover. I can honestly say that I have nothing bad to say about this issue. I loved every single thing about it, and the only thing negative for me is that I have to wait to find out what happens.